the Social Shuttle: The return of Steve Strange, King of the post Baby Boomers. The return of Steve Strange, King of the post Baby Boomers. A story comes courtesy of Britain's most feared blogger (by tabloid editors and writers ) Madame Arcati. Madame has received an invitation to the birthday party of the legendary Steve Strange, famous as the leader of the 1980's New Romantics and who first gained attention running a small club in Soho called The Blitz. The birthday bash is at a pub called the Green Carnation which describes itself as "the latest destination de decadence for the Soho set looking to add some sparkle to their Saturday night. ".Oh dear. The very idea that there is still one square inch of Soho that now could lay claim to 'decadence' could only come from the mind of a PR firm. Decadence was beaten out of Soho years ago by property developers and those interminably boring barista expresso bars that are popping up on every corner from Delhi to Reykjavick. Perhaps the only person who frequents Soho and may lay claim to decadence is the permanent fiance of Madame Arcarti, that delightful millinery challenged, Molly Parkin. The youngsters who flocked to The Blitz in the late 70's, early 80's wore weird and wonderful outfits, acres of make-up were a reaction to the Punk Rock movement. Stars were soon checking out the club including David Bowie, Bob Geldorf and Paula Yates, Yves St Laurent and it's said the late Lord Longford even stopped by. Steve was the King of The Kids.Whatever Steve wore, those kids appeared in their own version the following week. Strange went on to run a series of one nighter clubs in various venues with his best mate Rusty Egan. And it was just a matter of time as his other pal Boy George became spectacularly famous with his "Do You Really Want To Hurt Me", that Egan and Strange would form a band, Visage.They soon had their own a hit record "Fade to Grey'. Unfortunately long time success eluded Strange. Drugs and dramatic events such as a fire in his house took their toll as Steve went into a downward spiral and he retreated to his home village in Wales. He recountered his life, warts and all in his autobiography Blitzed! published in 2002. Now we must go back in time to another Shuttle pal, old Etonian Nicholas Shand, heir to a printing and publishing fortune from Shropshire. Shand had forsaken the family business and taken off for the hippy trail ( with a huge inheritance) to places like Goa and all points beyond before finally landing in the the magical Australian resort of Byron Bay, then a sleepy village and the country's most easterly point and living down it's former life as a whaling station. With a gorgeous rolling hinterland and beautiful beaches, schools of whales now safe from the spear gun could be spotted daily ambling by the coastline accompanied by flocks of dolphins. The whole area was God's gift to those seeking an alternative lifestyle. Byron Bay is now the most expensive resort in the country full of mega million dollar houses owned by the rich and famous but Shand then was able to purchase a few hundred acres and set up a small newspaper which the town lacked. With ink in the blood, so successful was his Byron Echo newspaper chain that after 10 years he refused a fortune to sell out to the Irish newspaper baron Tony O'Reilly seeking a foothold in Australian rural newspapers. In 1979 Shand decided to return for 2 years to Shropshire where he opened a successful restaurant 'Mad Jacks' named after Mad Jack Myton, a local legend, and in between serving the local gentry like the Ormsby Gores, frequently travelled to London to stay with our Shuttle staffer. On one such visit he left behind his Peruvian poncho, a souvenir from his hippy days. Upon awakening one morning Steve Strange seized upon the poncho and that Tuesday night appeared at The Blitz wearing it and looking like a Spaghetti Western cowboy, albeit complete with the usual layers of pancake, purple eye shadow and a bit of lippy. The following week, no less than 20 kids turned up wearing ponchos and cowboy hats, some even munching on cigars and looking like the cast of an Ennio Morricone production. They were afterall was said and done, just kids playing dress ups ! But it was all lost on the young female journalist trainee from the Independent newspaper who had been sent that night to get a handle on the new youth cult craze. She fled dazed and confused. There's a lesson there about fashion, style and trends or some sort of moral. I think. NB: Sadly Nicholas Shand died in a car accident on the notorious treacherous roads of Northern NSW. Outside the Byron council chambers sits a statue of him on a park bench, popular with the hundreds of tourists who flock to the area and have their photo taken with his cast-iron likeness, most of them having no idea who he is. 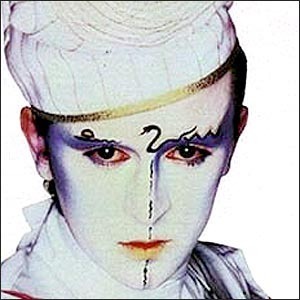 A study in contrasts : Visage & Steve Strange with Fade to Grey followed by Nicholas Shand.